In 1982, a television drama about five unemployed men who would do anything for work in Thatcher’s era hit the UK TV screens and ran for just one series. It was written by Alan Bleasdale, who in fact, wrote the majority of the episodes before Mrs Thatcher came to power. 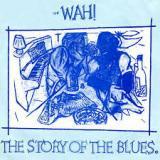 That series inspired one of the most memorable hits of the 1980s – The Story of the Blues by Wah! And not as many credit them, the Mighty Wah! – That came later. The song, which reached number three in the chart with only Men at Work’s Down Under at number two and Phil Collins’ You Can’t Hurry Love at the top, had a second part on the flip side which was called Talkin’ Blues. It takes a direct swipe at the media who were generally having a go at the kids without jobs at the time, “Just because you haven’t got a job doesn’t make you any less of a valuable person,” Pete confirmed. “All those people are getting indoctrinated on the news and in the papers and on TV being told they’re on the scrapheap and useless. People read paper and take those things as fact because someone who’s in a position of power, someone who’s supposed to know told them.” Come to think of it, has anything changed? The follow-up hit single Hope (I Wish You’d Believe Me) petered out at number 37 but then adding Mighty to the Wah! gave them a more respectable chart position for their final hit when Come Back reached number 20. How does Pete view it retrospectively some 30 years on? “NME said that I was one of the best songwriters to come out of Britain and The Story of the Blues is a classic song… if all I was remembered for was The Story Of The Blues I’d be the proudest man alive, because I hear the record now and it’s almost like listening to someone else’s record – it’s long enough ago and so many things have happened to me in between that I can have some distance from it and I’m proud of that song, but it also affected people’s lives – people come to me now and tell me how that record really inspired them when they were feeling low, and gave them some self-belief, and that’s as valuable to me as hearing people whistling the tune.